Google Still Supporting Climate Change Deniers. Why Google, Why? The heartland institute funded this billboard. Yet another Google-funded organization is out promoting conspiracy theories about the threat of man-made global warming. On Monday, September 23, the Google-financed Heritage Foundation hosted hosted Heartland Institute president Joseph Bast, Willie Soon, and Bob Carter to present “Climate Change Reconsidered II,” in which they argued that the world’s scientific community have systematically overstated the dangers to humanity of unregulated carbon pollution. Greenpeace activists confronted Bast at Heritage after the event, asking him to reveal whether Chicago magnate Barre Seid funded the multimillion-dollar climate-denial initiative. Bast refused to answer the question. Google’s support of the Heritage Foundation elicited new criticism from climate scientists associated with the company. “Their motto may be ‘don’t be evil,’ but they apparently don’t have any problem with giving it money,” climate scientist Andrew Dessler, Professor of Atmospheric Sciences at Texas A&M University, told Hill Heat in an e-mail interview. “If you want to be a corporate leader on climate change or science education, you should fund groups to combat the anti-science garbage produced by Heritage, not the other way around,” said climate scientist Simon Donner, Associate Professor, Department of Geography, University of British Columbia, when asked for comment. In a campaign led by climate accountability organization Forecast the Facts, over 150,000 people have signed petitions challenging Google’s support for climate deniers, and have staged protests in Washington DC, New York City, and Google’s headquarters in Mountain View, Calif. Drawings of Heartland Institute staff from Greenpeace's report on climate change denial, Dealing in Doubt. Yesterday, the Heritage Foundation hosted The Heartland Institute's CEO Joseph Bast, along with two of Heartland's contracted climate denial scientists (Willie Soon and Bob Carter), to present their new report that denies the seriousness of global warming. Greenpeace was there to ask Heartland about the report's funders, including billionaire Barre Seid, and to challenge Heartland's assertion that their work has any scientific validity (it doesn't). See the video for yourself. Heartland's "Climate Change Reconsidered," written by the usual climate denier suspects under the guise of the "Nongovernmental International Panel on Climate Change" (NIPCC) is intended to undermine new scientific findings from the United Nations Intergovernmental Panel on Climate Change (IPCC). Despite what Joe Bast and Heartland comms director Jim Lakely claim, their false report is not peer-reviewed, a formal process conducted by editors at actual scientific journals have other qualified scientists rigorously review and critique submitted work if it is to be approved for publication. You'll notice that Heartland's climate denial report isn't being published in any scientific journals, but rather from Heartland itself. This is because the document is a public relations tool intended to keep politicians and the public doubting that global warming is worth addressing. While Heartland continues politicizing science, demonizing credible scientists and using tobacco industry tactics to forge doubt over global warming, Americans are feeling the real toll climate change is already taking on society, by increasing the severity of storms like hurricane Sandy or pushing droughts, wildfires and heatwaves to new extremes. Heartland doesn't care, or even recognize, that global warming is already costing the global economy $1.2 trillion dollars and contributing to 400,000 deaths each year. They don't care that billion-dollar weathers disasters, intensified by climate change, are on the rise and impacting the U.S. economy and our infrastructure. Nor do they accept repeated research indicating the overwhelming consensus among credential climate scientists that human fossil fuel use is the primary driver of unnatural global warming--in fact Heartland's staff have repeatedly lied to cast doubt upon that research. Brothers Charles and David Koch have spent decades and millions of dollars to influence the news we read in newspapers, see online and watch on TV. The Kochs regularly convene high security meetings with high society attendees, many of whom work in the media, influence it, or own it. It's worth noting that the Koch-funded American Legislative Exchange Council distributed Arizona's controversial racial profiling law, SB 1070, to states around the country so private prison companies can rake a profit off the incarceration of immigrants. Stanley S. Hubbard, the billionaire chairman and CEO of Hubbard Broadcasting, which owns TV and radio stations in major cities across the country, including Washington DC's WTOP and WFED. Karl Eller, who founded the world’s largest outdoor advertising company, Clear Channel Outdoor, and launched numerous TV, radio and newspaper outlets that were absorbed by Gannett Company. Gannett owns USATODAY and dozens of other U.S. newspapers and television stations, and Clear Channel Outdoor stemmed from a Gannett advertising subsidiary purchased by Eller. Karl Eller served on the board of Turner Broadcasting, which owns CNN. He was chosen by the American Advertising Federation for its Advertising Hall of Fame in 2004. Ramesh Pannuru, the senior editor of the National Review, an outlet funded by the Charles Koch Foundation. National Review's "Planet Gore" blog is dedicated to dismissing global warming. Foster Friess, the billionaire who provided money to launch the Daily Caller, a conservative news outlet. The Daily Caller has criticized the Obama 2012 campaign's "anti-Koch" activity. Stephen Moore of the Wall Street Journal editorial board, contributor to the National Review and frequent TV news pundit. Stephen Moore used to work at the Cato Institute, which was founded by Charles Koch in the 1970's and continues to be directed by David Koch and other Koch Industries associates. Moore advises the Koch-funded American Legislative Exchange Council (ALEC) and regularly collaborates with the Heritage Foundation and Americans for Prosperity. In 2009, Moore told attendees of the 2009 RightOnline conference, "What would we do without the Wall Street Journal and FOX News, Right? And Americans for Prosperity?" Moore is a former director of Donors Capital Fund, according to 2010 IRS tax filings. Steven Hayward, who is affiliated with numerous groups financed by the Kochs as well serving as treasurer and board member to Donors Capital Fund. DCF and sister group Donors Trust hide money from the Kochs and other corporate interests to groups like the Heartland Institute, the Franklin Center, CFACT, Americans for Prosperity, and many other groups connected to Hayward--read more on Steven Hayward and the Donors Trust network. Steven Hayward frequently dismisses global warming in the Weekly Standard, the National Review, and Powerline Blog, run by attorney John Hinderaker, whose firm has represented Koch Industries. Glenn Beck, the former FOX News hysteric who thanked Charles Koch on air for providing misinformation on climate change he presented during his show. Dixon Doll, the co-founder and General Partner of DCM, a venture capital firm involved in telecommunications. Dixon Doll sits on the board of directors of DIRECTV. The New York Times included the brothers' connection to oil and gas billionaire Philip Anschutz, who owns the Weekly Standard, the Washington Examiner, and other outlets through Clarity Media Group (check out the Weekly Standard's puff piece on the Kochs). Phil Anschutz, a fellow financier of climate science denial groups, is one of many elites who attends the Kochs' twice-annual strategy meetings, where millions of dollars are raised to influence politics through groups like the Heritage Foundation, Americans for Prosperity, the Franklin Center, and the other members of the State Policy Network. The State Policy Network and its affiliates often gin up their own astroturf media, with the Franklin Center's "Watchdog" websites dishing out content to bolster the campaigns of Koch's flagship SPN operations like Americans for Prosperity and ALEC. The Franklin Center is 95% funded by Donors Trust, the "Dark Money ATM" that hides money from the Kochs and other secretive political manipulators. Media Matters reported numerous accounts from Tribune Co. paper employees concerned they would be a "conservative mouthpiece" for Koch Industries. As reporters from Tribune's various newspapers voice their discontent, Forecast the Facts and Courage Campaign have obtained over 100,000 petitions to the Tribune Company against the Koch bid, citing Tribune reporting on climate change that could be threatened by Koch ideology. The public pressure has been acknowledged by @TribuneCo on Twitter, though the company remains noncommittal. Freshly released today: a report by the Checks & Balances Project examining how often top U.S. newspapers fail to attribute fossil fuel ties to organizations or people that appear news articles to promote fossil fuels, demonize clean energy or promote delay of climate change solutions. Tracking ten of the top fossil fuel front groups in 58 leading U.S. newspapers, the new report finds over 1,000 instances where ties to or funding from coal, oil and gas interests was not disclosed when including a shill group or quoting one of its "experts." Only 6% of the time were fossil fuel ties disclosed when these top 58 newspapers reported on the ten fossil fuel front groups examined in the study. These groups wind up in the paper, on average, at least once every other day. In the five-year window the report uses, the ten front groups got at least $16 million from coal, oil and gas interests. These groups, and their proponents, have been quoted on average every other day for the past five years in 60 of the largest mainstream newspapers and publications. Despite having received millions of dollars from fossil fuel interests, such as ExxonMobil and Koch Industries, these groups’ financial ties to the fossil fuel industry are rarely mentioned. Deniers are already taking notice--see Steven Milloy's complaints here. Steve Milloy has been a central climate denier, who was paid to shill for tobacco company Phillip Morris and oil giant Exxon before work for the Cato Institute (see below) and starting the climate denial website "JunkScience." Senator Jim DeMint (R-SC) has announced his departure from the U.S. Senate in order to become head of the Heritage Foundation, a conservative think tank with notable support from fossil fuel interests like the Koch brothers ($2.73 million, 2005-2010) and ExxonMobil ($250,000, 2005-2010). Both Exxon and the Kochs are known for their heavy financial support to organizations that promote doubt over climate science, peddle fossil fuel use and attack clean energy on precedent. The Heritage Foundation has played a consistent role in promoting the oil ideology--see DeSmog, Greenpeace, ExxonSecrets and SourceWatch for documentation. Senator DeMint, commonly associated with the tea party, has been a particular favorite of the Charles Koch and David Koch. In the 2010 election, David, Charles and Elizabeth Koch (married to Charles) funneled a collective $12,000 to Senator DeMint's election campaign committee, on top of a $10,000 contribution from Koch Industries. Only a handful of politicians were handpicked by the Kochs in the 2010 election for direct contributions--see p.22 of Koch Industries: Still Fueling Climate Denial). Here is a breakdown of total donations from the Koch family members and Koch Industries to Sen. DeMint and his associated leadership PACs (the Senate Conservatives Fund and MINT PAC) during DeMint's Senate career. Each donation was the maximum legal contribution limit. Lisa Thrun, the chair of grassroots for the New York Chapter of Americans for Prosperity, was invited by the Tompkins County Republican Committee to speak about the economic impacts of RGGI. Pronounced “Reggie,” the Regional Greenhouse Gas Initiative is a cap-and-trade program, which promises to reduce CO2 emissions 10% by 2018 among Connecticut, Delaware, Maine, Maryland, Massachusetts, New Hampshire, New York, Rhode Island, and Vermont. As the New York lawsuit is pushed forward by the polluter apologists running Americans for Prosperity, we will see if AFP is can finish pushing New Jersey out of RGGI. Gov. Chris Christie caved to AFP pressure last year, announcing New Jersey's withdrawal from the profitable program and then bragging about it right to the Koch brothers faces at their private political meeting in Vail, Colorado. The Koch brothers are not running out of money. Their wealth has increased by $13 billion each in the last five years (Forbes, 2006 and 2011) and they will continue to bankroll ideological attacks on environmental initiatives that threaten their billions in private profits. What Charles and David have lost is the ability to ghost run the country in secret. PolluterWatch will continue to track the development of Koch-backed attacks on the Regional Greenhouse Gas Initiative and other dirty campaigns. For more, see PolluterWatch's profiles for Koch Industries and Americans for Prosperity. Then Greenpeace released our March, 2010 report, “Koch Industries: Secretly Funding the Climate Denial Machine,” that documented the Kochs’ systematic funding of the political system in order to stop action on climate change, including funding campaigns on climate denial. 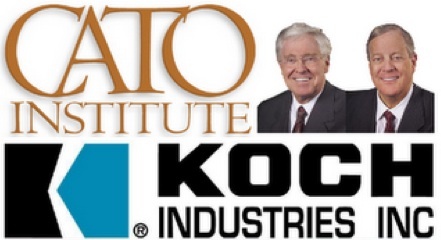 We have now updated this report; Koch Industries: Still Fueling Climate Denial. Over the last year, the publicity-averse brothers have found themselves and their company, Koch Industries, under increased scrutiny from the public and the press. But the Koch Brothers continue to use their oil wealth to fund campaigns, front groups, think tanks, and politicians to sabotage climate and clean energy policies. Greenpeace’s new research throws a focus on some of the information that has come to light over the last year, not least the Kochs’ previously-secret twice-annual gatherings of their rich and powerful allies to plot their strategy. In one of our three new case studies, we present a dossier showing that the media magnates invited to their summer 2010 meeting in Colorado have provided a convenient echo chamber for the Kochs' media network, thrown into overdrive as more people become aware of the Koch Brothers and how they use their oil money. Our next two case studies demonstrate how Koch’s network of climate denier front groups have attacked state policies that were developed to curb climate change. One of these new case studies documents how the Kochtopus is currently attacking the Regional Greenhouse Gas Initiative (RGGI), a multi-state effort in the Northeast to reduce climate-changing greenhouse gas emissions. Ironically, Koch Supply and Trading, a subsidiary of Koch Industries, has participated in RGGI carbon trading even as Americans for Prosperity has campaigned to get states to pull out of RGGI. Our third new case study offers a full overview of a similar multi-pronged attack on California’s Global Warming Solutions Act, which took place during the 2010 election cycle when Koch financed ballot Proposition 23. This effort was supported by Koch funded groups Americans for Prosperity and the Pacific Research Institute. The Kochs’ funding of the climate denial machine continued apace in 2009 (the most recent year that Koch foundation tax forms are available), when they contributed over $6.4 million dollars to some 40 organizations that continue to deny the scientific consensus on global warming while attempting to slow or block policies to solve the climate crisis. The Kochs have now given a total of $55.2 million to these groups since 1997, $31.6 million of which they spent between 2005 and 2009. Favorite Koch Foundation organizations like the Cato Institute and the Heritage Foundation, the Mercatus Center and the Institute for Humane Studies continued to be top beneficiaries. Americans for Prosperity, a front group founded by David Koch, has now received over $5.6 million in documented donations from the Koch foundations. It doesn’t stop there. Where our 2010 report found that Koch Industries lobbying expenditures totaled $37.9 million dollars since 2006, that figure has now risen to over $49.5 million, an increase of $11.6 million over the last year. In 2010, Koch Industries was the largest political spender of the entire energy sector, dumping $2,645,589 in campaign contributions from their political action committee. Koch currently outspends heavyweights ExxonMobil, Southern Company, American Electric Power and Chevron. In addition, the Koch Brothers and their spouses directly contributed over $360,000 to federal politicians in 2010. There’s more. Plenty more. Visit our updated Koch Industries web page for the full deal. UPDATE: SSSIP press release posted. Speaking truth to climate lies, students at Swarthmore College resisted dirty industry scientist-for-hire Patrick Michaels during a presentation for a modest audience yesterday. As Michaels pecked away at credible scientific consensus over climate change, students held up signs highlighting Michael's true expertise: acting as a mouthpiece for the likes of ExxonMobil and other major polluters who have funded his anti-scientific public relations career. 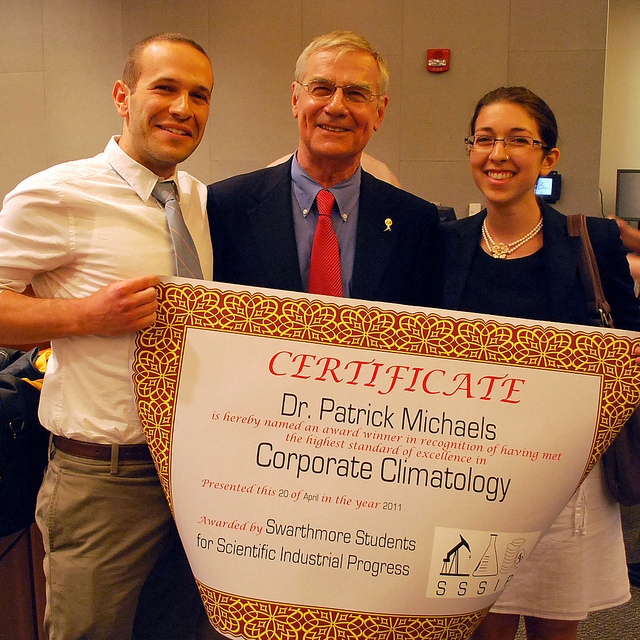 Recognizing his expertise, the satirical "Swarthmore Students for Scientific Industrial Progress" were photographed presenting Dr. Michaels with a Certificate of Corporate Climatology. Finally, a credential Michaels has earned! Michaels has been a particularly useful arm of the climate denial machine, as his credentials include an actual Ph.D in climatology, lending him unearned legitimacy as he has spent recent years peddling misinformation about global warming on behalf of the coal and oil industries. Michaels has long been an ally to front groups heavily finanaced by ExxonMobil and Koch Industries, including the Cato Institute, the Heritage Foundation, CFACT, the Competitive Enterprise Institute, and numerous others. He has published several books attacking the research of climate scientists who actually are publishing peer-reviewed climate studies, the conclusions of which are against the profitability of the polluter giants who fund Michaels' work. In the two weeks that followed the release of hacked emails between climate scientists at the Unversity of East Anglia, Michaels appeared in over twenty media interviews on major news networks to broadcast the false accusation that climate researchers were manipulating data. Michaels has become increasingly recognized as a corporate polluter megaphone. In late January, 2011 California Representative Henry Waxman sent a letter to House Energy & Commerce Chairman Fred Upton (R-MI) asking him to question Michaels over his failure to disclose sources of funding that present a clear conflict of interest in his role as a climate misinformer. Pat Michaels at Swarthmore from Swarthmore Media on Vimeo.